Once all of your data is synced and edited, you can proceed to export the data. Data can be exported to various formats. 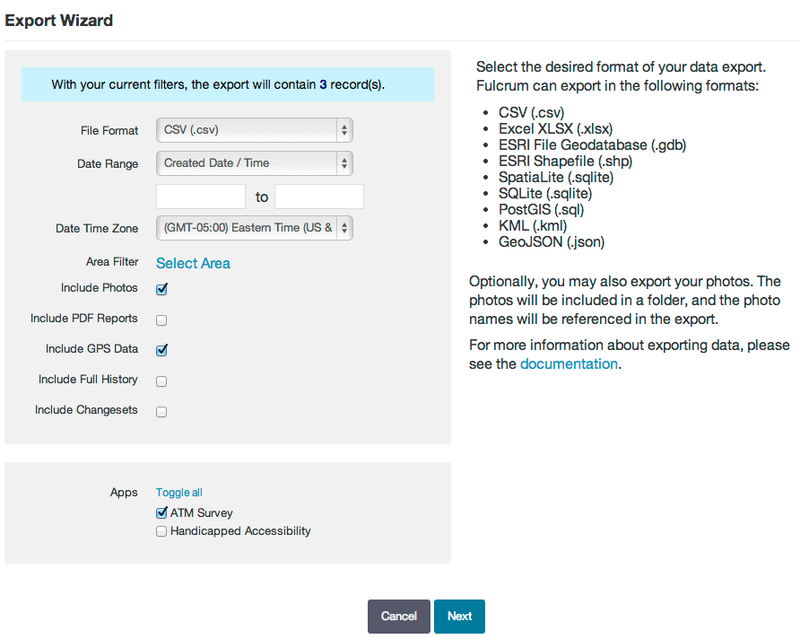 Return to the Fulcrum homepage by clicking the Fulcrum logo, or the ‘go back’ link from the records view. Or, select ‘exports’ from the menu bar. There are two ways that you can get to the export wizard. The first option is to click on the ‘exports’ button from the menu towards the top right of the dashboard page. This will take you to the export dashboard page, where you can download and delete previously completed exports. To create a new export click the ‘start export wizard’ button. This option is good if you wish to export data out of multiple apps. Option two is to click the export button for a specific app. This will take you directly to step 1 of the export process. For this tutorial, we will only be exporting data out of one app so option two would be better. Once you start the export process the wizard will guide you through the entire process. There are three steps to the process. The first step is where you will select the export options, file type, and apps and/or projects you wish to export the data from. The second step is a review step, where information about your export will be given. The final step is initiating the export, then once the export has been completed, downloading the export. You can learn more about the exporter from our exporting data section of our online manual. Select the export file format, which objects to include, and optionally filter by area or date range. You can export data from more than one app, when applicable. You will also notice that at the top of the page you can see how many records will be contained in your export files. Click ‘next’ once you have chosen the settings for your export. Review and confirm your data export settings. If you need to make any changes, click the ‘Back’ button to return to the previous menu. Click the ‘Finish’ button to proceed with the export. After the export has completed, download it.